Americans should have “traverse the nation by car” on their life list — the whole shebang of purple mountains majesty, amber waves of grain, obnoxious tangles of traffic (from the verse I would add to update the song for modern audiences) . Aim for 250 to 300 miles a day rather than 600. You can do that in five or six hours, leaving time to get off the Interstates and take day trips to the really cool stuff. The only redeeming characteristic of a superhighway is its ability to get you from point A to point B. Everything worth seeing is on the state and federal highways that zigzag across the landscape. Driving your own car will encourage a major compromise: the drive to and from wherever you live. I think it’d be much wiser to buy plane tickets to and from the coasts of your choosing, and rent a car for your driving. Weekly rates are far more reasonable than dailies and you typically can get unlimited mileage. You save wear and tear on your own car and if it breaks down, it’s somebody else’s responsibility to get you back on the road again. Say you pull in for gas at a truck stop in Arizona and see a gift shop of alleged Indian artifacts across the street that you’d really like to check out because you’re into kitsch. A hard-and-fast itinerary leaves little chance for checking that stuff out. Some sites like the Grand Canyon simply must be seen, but if fun is the main goal of going on vacation, give yourself a chance to have some. The only thing worse than being stuck in your own town’s traffic jams is being stuck in somebody else’s. Left turns and lane changes that come naturally on home turf can be a white-knuckle nightmare in foreign cities. 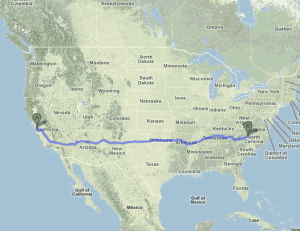 I’d love to do this in separate trips: San Diego to Portland, Maine, one year and Vancouver to Miami the next. These routes could add several hundred miles and a couple extra days of driving, but you’d get a far tastier range of terrain and weather. I haven’t driven the far northern Interstates that go up into Washington state, but I can speak to the three middle routes. I-40 runs from Wilmington, NC, to Barstow, CA, offering most of the southern United States from a single highway. It passes through must visit music towns of Memphis and Nashville and runs through Indian country through all of Oklahoma and much of New Mexico and Arizona, two states where you could spend months exploring the southern high desert. I-80 goes from Chicago to San Francisco, crossing a thousand miles of prairie before the terrain gets interesting at the Wasatch Range dropping into Salt Lake City. The drive from Salt Lake to the Sierra is pretty dreary, but crossing the Sierra and driving down to the Bay Area is a wonderful drive (just avoid the weekends; the whole population of the Bay Area seems to head for the hills every Saturday and Sunday). I-70 Goes from Baltimore to southwest Utah — crossing much of the Midwest farm country, which can be flat and boring, but it gets very exciting coming into the Front Range of the Rocky Mountains at Denver (the mountains loom dark and gray like a distant thunderstorm for several hours before you hit Denver; it’s one of the most impressive scenes in North America). I-70 continues through the spectacular Rocky Mountain heights and continues through the amazing canyon country of Utah. Picking your route may be the hardest part. No matter which one you choose, you’ll give up something worth seeing. My friend Ben refers to the Interstates as SDRs (Sensory Deprivation Routes), I heartily agree! We just took a vacation in Michigan, northern Wisconsin and Minnesota, and planned it so we could head out on state highways and U.S. 2, much better than the trip back on I-94. I have the great dream of flying in to LA and driving across to Florida, up the coast to NYC and up through Canada and back down to LA. I think I’d like to do it over a 6 month period though. You have just got me thinking about it again! Seek out Peter S. Beagle’s I SEE BY MY OUTFIT, a true tale of how he and a pal crossed the US on a couple of motor scooters in the days BI, Before Interstates. Beagle is more known for his screenplay of the animated LORD OF THE RINGS and his fantasy work, but this is a charmer. The ROAD FOOD GOOD FOOD series by Jane & Michael Stern. I-90 may be the best of the lot in ongoing scenery. Coming from Metamora, it is dull but green in Minn. Badlands, [Sturgis weekend], Black Hills, real cowbioy country in Wyoming. then Yellowstone and the Grand Tetons. As to I-70, University of Kansas geologists have established that Kansas is indeed flatter than a pancake. Burger Purgatory: the huge, vile feedlots in Nebraska, Colorado, seen this year when we went from here > Omaha > Denver for the Pstchedelic San Francisco Poster show this summer. We passed on burgers for a while thereafter. See FOOD, INC. Thanks Mike. Have just ordered a copy of Amazon. I have read both books and both are excellent reads! If you want a copy go to Amazon.com, they have both titles. Once you settle in at Winston-Salem, feel free to call on me if you would like a hiking companion on a weekday sometime. I’m not an expert, and I haven’t been everywhere in your new neck of the woods, but it’s always fun to go exploring. I was at Stone Mountain State Park today for the first time in probably 10 years – it is even better than I remembered. Driving all over the U.S. is my dream , but first I have to win the lottery . Otherwise I’m only driving back to work . We did it in three days with a dog, 4 times. 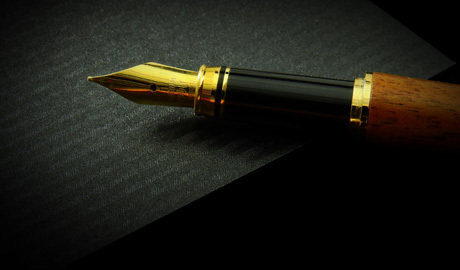 I'm an experienced technology content marketing writer who can help transform your B2B content into a conversion engine. Find out more at Verb Nerd Industries. The best way to reach me is to shoot me an email. Copyright © 2013 Tom Mangan, Verb Nerd. All Rights Reserved. Gridiculous Pro created by c.bavota.